SPRING 09. Stanford Engineering's European Entrepreneurship and Innovation Thought Leaders Seminar is a weekly speaker series that presents industry leaders from Europe's hitech startup, venture finance, corporate and university research and technology commercialization communities to share their insights and experiences with aspiring and veteran entrepreneurs from Silicon Valley. From Ireland to Russia, and from Scandinavia to the Mediterranean, Europe's technology sector is today playing a growing role in bringing new energy, environmental, water, information, medical device and life sciences technologies to market thru small- and medium-sized enterprises. Europe's countries, however, face substantial challenges in rapidly moving to the marketplace the technical innovations that are being developed in universities, national laboratories and corporations. Many of these regions are increasingly looking to Silicon Valley to accelerate this process and train a new generation of entrepreneurs and innovation professionals. We invite you to join us each week for a lively discussion of the challenges and opportunities facing European entrepreneurs, investors and innovation sector organizations. Our first Spring session will continue last Quarter's program with an indepth look at Estonia's venture capital and biosciences sectors. Our Government Partner Enterprise Estonia will also give a brief overview of Estonia's economy and innovation sector. During his career as an entrepreneur, Allan Martinson has launched, managed and sold several companies in the Baltic TMT sector, all of which became leaders in their respective industries. Martinson is or was a member of the supervisory boards of MicroLink, SAF Tehnika, Baltic News Service, Tallinn Stock Exchange, the leading Estonian media company Ekspress Grupp, the IT company Regio, the Estonian ICT Association and the Estonian Academy of Arts. EGeen International is a CRO focused on doing clinical trials for biotech companies in selected countries in Eastern Europe. Before founding EGeen in 2001, Kalev worked at the neurogenomics company AGY Therapeutics of South San Francisco, followed by research at Stanford University and advisory work with Asper Biotech and Toshiba. He completed his graduate degree with Prof. Tamas Bartfai at Stockholm University and post-doctoral training with Prof. Peter Seeburg at the Max-Planck Institute for Medical Research in Heidelberg. Dr. Kask has authored numerous scientific publications and has patented genomics derived drug and diagnostic targets. Our second session features our first German venture capital firm, and also our first clean tech startup company out of the UK alternative energy sector. Both speakers will expand on introductions to European VC and UK clean tech provided by Alex Fries and Robert Trezona of The Carbon Trust from last Quarter, and by Allan Martinson in the previous session. Opening Remarks: Prof. Fritz Prinz, Chair, Mechanical Engineering Dept. Uli Fricke has been Founding General Partner and CEO at Triangle Venture Capital Group since 1997. On the investment side, Uli focuses on mobile communications and media, chairing a number of boards of Triangle’s portfolio companies. Triangle has advised investments in 15 start-up companies, acting as lead investor in all portfolio companies with more than 60 transactions completed, including follow-on rounds and several exit transactions. Uli is Chairman of the European Venture Capital Association (EVCA) Professional Standards Committee. Sukbae Cha — CEO, ACAL Energy Ltd.
Dr. S.B. Cha is the CEO of ACAL Energy, a UK based start-up company developing a new type of proton exchange membrane (PEM) fuel cell architecture that promises to substantially reduce the cost and improve the reliability of PEM fuel cells, ultimately enabling PEM fuel cells to become a significant contributor to the future energy generation mosaic. ACAL completed a large funding exercise in December 2008 and investors include UK venture capital firms, led by the Carbon Trust Investments, and large corporations from Belgium and Japan. ACAL will be introducing a 1kW demonstrator in 2009. Session Three features two prominent university researchers who address the growing role of European professors and universities in entrepreneurship, innovation, technology commercialization and spinouts of leading technology startup companies in the displays and electronic design automation sectors. The lecture will also feature a short overview by our Government Partner FinNode regarding Finland's innovation sector, and a quick snapshot of the innovation and venture capital scene in the Czech Republic. As CEO of MultiTouch, Petri is responsible for overall strategy, customer relationships and building and maintaining MultiTouch’s international presence in the digital signage and large multitouch screen markets. Over the past 20 years, he has worked as a senior executive and co-founder with a number of ICT, media and design companies including Sofia Digital, TJ Group and DataUnit Consulting. Petri has been involved in several of venture financing rounds, and arranged an MBO deal and company merger. He holds an MSc degree from Helsinki University of Technology, and has worked for several years in the Helsinki Institute for Information Technology (HIIT) as research manager. Alberto Sangiovanni Vincentelli holds the Edgar L. and Harold H. Buttner Chair of Electrical Engineering and Computer Sciences at the University of California at Berkeley. He was a co-founder of Cadence and Synopsys, the two leading companies in the area of Electronic Design Automation. He is the Chief Technology Adviser of Cadence. He is a member of the Board of Directors of Cadence and the Chair of its Technology Committee; of UPEK, a company he helped spin off from ST Microelectronics; and of Sonics, and Accent, an ST Microelectronics-Cadence joint venture he helped found. This session presents two prominent serial entrepreneurs from Norway and Italy in the media and open source software industries. The session will also feature a short overview by our Government Partner Innovation Norway regarding the Norwegian innovation sector. Bjørn Haugland is a Norwegian based serial entrepreneur with a global network in the survey research world. Within the research space he founded Feedback Research and Confirmit. He is co-founder and Chairman of Symphonical, ACTonFACT and SurvAid and is a board member of Attentio and Open Advertising Exchange as well as Chairman of the Norwegian Market Research Association. He has skied to the North Pole and summited four of the “Seven Summits” around the world. Fabrizio Capobianco is CEO of Funambol, the mobile open source company. Fabrizio is both a serial entrepreneur and a veteran executive, with work experience that includes stints at Reuters and Tibco. He founded the first Italian Web company, Internet Graffiti, in 1994. Capobianco holds a Ph.D. in computer science at the University of Pavia, Italy. He was recognized in 2007 as a top "40 under 40" leader by American Venture Magazine and by the readers of Mobile Village for being a mobile email visionary. He writes a blog that was voted among the 20 best in the wireless industry (www.fabcapo.com). In this session we deepen our focus this quarter on emerging energy and medical informatics entrepreneurs and startup companies from the UK and Germany. The role of development agencies such as The Carbon Trust in seed-stage funding of new companies will be highlighted. Richard Yemm - CTO/Founder, Pelamis Wave Power Ltd.
From a background in wind energy, Dr. Richard Yemm founded Pelamis Wave Power Ltd (PWP) in 1998. Over the past ten years PWP has grown to become the leading company in this exciting new sector. As CEO until August 2007, Richard raised over $50 Million from a range of sources to fund the business, and led the major technical effort to deliver the world’s first wave electricity from offshore waves into an onshore grid in 2004. As part of the continuing focus on business development and growth Richard recently moved to the post of CTO. PWP is currently in the process of rolling out its second generation machine, with the first unit on order to the German utility E.on. Dr. Horst Bruning is CEO and Founder of Animage LLC and Exxim Computing Corporation. Animage is a manufacturer of multiple modality x-ray scanners for the veterinary market. The company is close to rolling out FIDEX, a first product designed for companion animal clinics, with initial installations in the Bay Area. In 2002, he founded Exxim Computing Corporation which he grew into a successful niche company providing medical imaging companies with highly efficient software tools to generate three-dimensional x-rays. Prior to becoming a successful entrepreneur, Horst pursued a career as R&D manager at Siemens Healthcare in Germany spanning almost 20 years. In this session we shift our attention to how European and US corporations manage talent and human resources. Our speaker - a highly respected and passionate Danish entrepreneur - will discuss his own personal story as a Danish entrepreneur coming to the US, how senior executives in Europe and the US approach talent management from different and similar perspectives, and the astounding growth of SuccessFactors to global leadership in six short years. The session will also feature a short overview by our Government Partner Innovation Center Denmark regarding Denmark's innovation sector. Lars Dalgaard runs SuccessFactors, the fastest growing public software company in the world. SuccessFactors is an industry leader in on-demand Business Execution Software (BES), driving performance at every level of an organization. Lars brings over 15 years of proven strategic and hands-on operational and leadership experience worldwide. Before SuccessFactors, Lars was an integral global leader at Unilever, one of the 10 largest transnational employers in the world, and Novartis, at the time one of the largest pharmaceutical companies globally. Lars has a Masters of Science from Stanford Graduate School of Business, where he was a Sloan Fellow, and a B.B.A in economics, psychology and consumer behavior from Copenhagen Business School. Our seventh session will showcase angel investing in Europe and the United States. Member groups of the European Business Angel Network (EBAN) will discuss the state of organized angel investing in their countries. Together with leaders from the US and Silicon Valley angel group communities, we will explore where angel investing is headed in 2009 and beyond, and the salient differences between the US and Europe in this critical - and often neglected - area of seed- and early-stage venture finance. Claire Munck serves as General Manager of the European Business Angel Network, the trade association for business angels and early stage investors. She is a speaker at numerous conferences around the world on the topic of business angel finance, and is the author of several publications related to business angel financing and the role of business angel networks in European economies. Claire has taken part as an expert in the United Nations Economic Commission for Europe Committee on Innovation Financing for Development in 2007. Since March 2009, Claire has joined the Board of Be Angels, the business angel network for the Walloon Region in Belgium. Marco Villa is a Business Angel and Managing Director of Italian Angels for Growth, the largest angel group in Italy, that he co-founded in 2007. Marco is also owner and Managing Director of Mirade Ventures Srl, a small venture firm specializing in equity investments in high-potential start-up businesses. He invests in Italy and abroad across industries and is involved as an investor, executive and non-executive director in start up businesses in Italy, China and Latvia. After studies in business management in Germany, the USA and the UK, Arne-G. Hostrup assumed the commercial leadership of a German medium-sized company for several years. He then moved into the franchise-field of an international fast-food-company before being responsible for the Northern Bavarian Business Plan Competition as project leader in 2000. Further, he acted as Finance Director and involved in building a start-up in the media branch for two years. Since January 2003 he is Managing Director at netzwerk|nordbayern. His main ambits are fiscal planning and private-equity finance of high-growth companies by business angels and venture capital. He is a Member of the Board of the European Business Angel Network (EBAN). Kit Hunter Gordon is the Chairman of Seraphim Capital and one of the Managing Partners. He has over 20 years experience of early stage investment. He is also the Managing Director of The Summit Group which he raised £7m to found in 1985. Kit was responsible for growing The Summit Group into a diversified financial group encompassing vendor finance, property investment and services, structured finance and insurance - many of which commenced as start up operations. Under Kit's guidance, The Summit Group raised more than £150m of capital, and grew its total assets to more than £500m. Marianne Hudson leads two nonprofit organizations: the Angel Capital Association (ACA), the professional alliance of angel groups in North America, with 165 member groups representing 7,000 individual accredited investors; and the Angel Capital Education Foundation (ACEF), which provides information, education, and research about angel investing to investors, policy makers, university leaders, entrepreneurial support professionals, and entrepreneurs. ACEF was founded by the Ewing Marion Kauffman Foundation in 2005 and spun out of Kauffman as an independent charitable organization in March, 2007. Laurie Lumenti Garty is a Managing Director in the Entrepreneur Services Group at SVB Capital where she is leading the Bank’s efforts to strengthen its relationships with universities, incubators, angel and seed stage investors. Garty has significant experience working with entrepreneurs and has an extensive network of angels, venture capitalists, entrepreneurs and CXOs. Our final Spring Quarter session will explore innovation practices in Finland's Nokia, one of Europe's leading technology corporations. The teaching team will also give a summary overview of the European innovation ecosystem based upon the major themes touched upon by our speakers during Winter and Spring quarters. 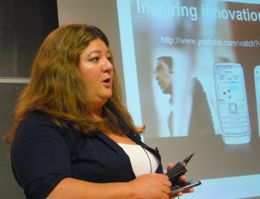 Lisa Waits leads new business initiatives and technology transfer for the Palo Alto Nokia Research Center. She is passionate about addressing real-life customer needs and brings this focus to her work of guiding and nurturing mobile consumer services created in one of Nokia’s most advanced research offices for both developed and emerging markets. Services she is currently focused on include Nokia’s industry-defining community-enhanced traffic system, its versatile and functional mobile conferencing tool as well as novel emerging market commerce systems. Dr. Burton Lee directs Stanford Engineering's European Entrepreneurship and Thought Leaders speaker series. His professional credentials span over 15 years of innovation sector entrepreneurial, senior executive leadership and advisory positions with venture-backed startups, global technology corporations, venture capital and private equity firms, angel investor groups, federal S&T agencies, state economic development offices, leading research universities, foreign governments and industry associations. Burton's management and technical experience includes senior executive and research positions with Hewlett Packard, GE Global Research, DaimlerChrysler AG and NASA in the United States, Europe and Japan.